Create your guest list and send an invitation (we still totally love & appreciate good ol’ invitations in the mail... who doesn’t love receiving an invitation, particularly during the holiday season?! we make it easy & fun to order invitations, too! For just $2.00 an invite, you can choose from our collection of invitation inspiration or create your own! No minimum either- so invite 2 or 200, we’ve got you covered! Put out funny cocktail napkins as conversation starters. Make extra personal by giving each girl her own pack to go home with! Have your guests use a cup they can go home with! Currently loving our new reusable collection that you can get a box of 12 of for $19.95 and just add $10.00 for personalization! 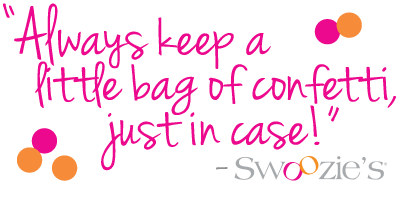 Sweet treats are always a great takeaway. Give each guest a small Sugarfina and even use as a placecard setting! Or sample our new Candy Club and create take-away goody bags! SHOP OUR FULL COCKTAIL COLLECTION ONLINE NOW! 15 Gifts That Have Us Saying YAY!